← Legally Darcy – Giveaway Winners Announcement! This is the type of trip a girl doesn’t do alone, so I invited a few friends to join Rui Pedro (who was practically dragged) and me in this adventure, and that is how I ended up visiting Chawton and Alton with Joana Starnes and Ana from My Vices and Weaknesses on a beautiful Sunday afternoon, and Bath and Lacock the following day with Joana and Mira from Obsessed with Mr. Darcy. This small road trip started in London with Rui doing his best to drive on the “right” side of the road, changing the gear with his left hand and understanding the priorities in roundabouts, thankfully Ana was there to give him a hand because I just kept thinking we were going to crash. 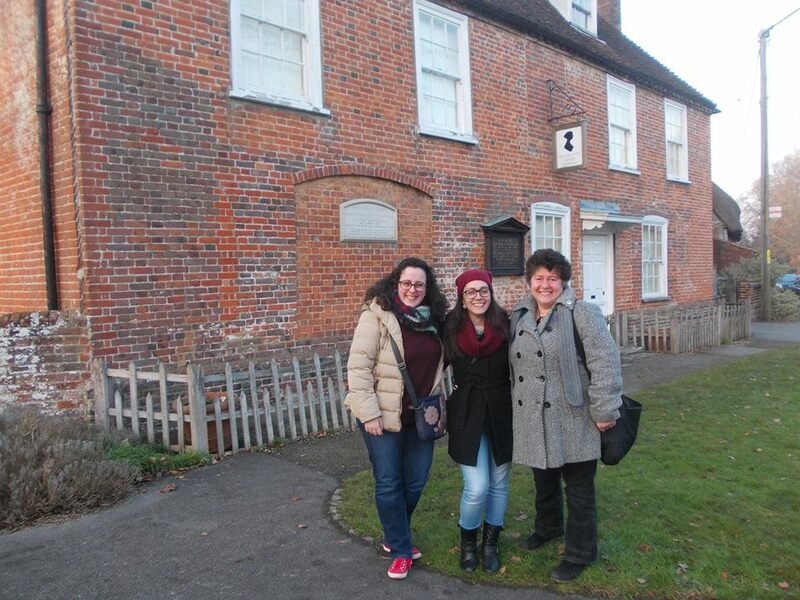 We were still in the highway when we got a call from Joana saying she was already in Chawton and Jane Austen’s House was closed. Can you believe it? I took a 2h30 min flight, rented a car, drove for 2 hours, but didn’t check if the house was open before doing all that. The truth is, I never expected it to be closed! But it looks good from the outside doesn’t it? People say we have to look at the bright side of life, and in fact, this little lapse was the perfect opportunity to spend hours and hours talking about Jane Austen, Pride and Prejudice, Persuasion and JAFF with Joana and Ana 🙂 Rui just listened and waited with a patience of a saint 🙂 It also gave us some time to go to Alton and see some of the places Jane visited and it ended up being a perfect day! 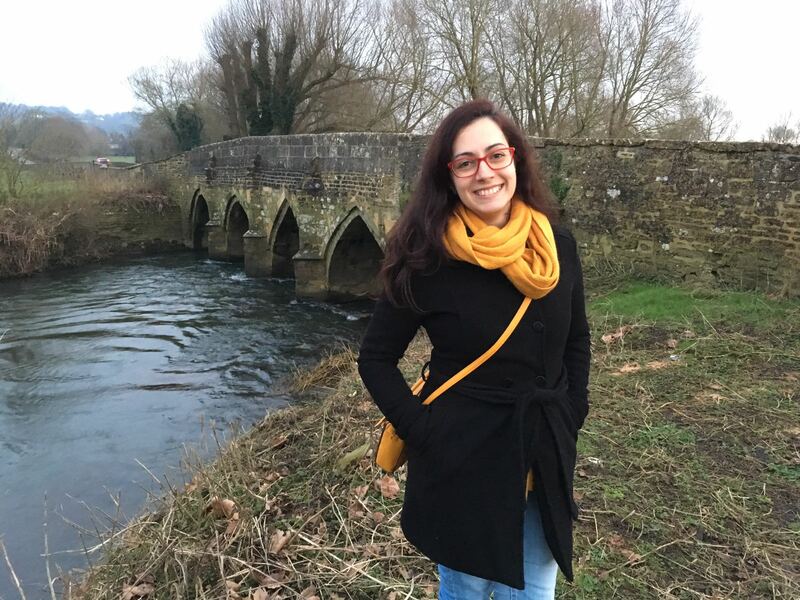 Monday morning I woke up in this beautiful but freezing scenery thinking that Elizabeth Bennet had to be nuts to regularly go on morning walks with the british weather, but I definitely recommend the hotel where we stayed (The Old Mill) for those visiting Bath with a vehicle. It is located in the countryside, 3 miles from Bath, and the peace and quiet we can feel there is enough to transport us back to the 19th century. After a delicious english breakfast (I even had beans), I soon found myself in the center of Bath where I finally met Mira. I have visited many places but none is like Bath, I absolutely love Bath!!! I loved it as much this time as the first time I was there and had the advantage of visiting it this time with true connoisseurs of Bath’s filming locations 🙂 We had not walked 500 meters when Joana pointed me the store where Anne and Captain Wentworth first see each other in Bath (swoon…), it looks very different and I didn’t go inside but it was nice to know that was the place. Now my imagination may drift to that store when I re-read Persuasion. This is probably one of the most known places in Bath, and I can see why. It is just astonishing! Pictures do not do it justice and they can only give a small idea of how beautiful and well kept this place is. It was also one of the sites used for the filming of the 2007 Persuasion film, and even if I am on Ciaran Hinds team, and definitely prefer the 1995 version, everytime I see the Royal Crescent I think of this adaptation. Do you think there is a lot of discussion regarding favorite adaptations for Persuasion as well? I know there is a lot of talk regarding the favorite Pride and Prejudice adaptation, but what about Persuasion? Which is your favourite? When I visited Bath in 2014 I didn’t enter the Assembly Rooms, so this time it was mandatory to see them. They were designed by John Wood the Younger in 1769 with the purpose of being a place for dancing and music. When they were completed in 1771 they were described as ‘the most noble and elegant of any in the kingdom’. During our guided tour I learnt they were bombed and burnt out during the Second World War and due to budget constraints the place was very close to become a parking lot! Luckily the funds were obtained in time and Sir Albert Richardson undertook the restoration of the building before it’s reopening in 1963. The building has rooms arranged in a U shape and there are four main function rooms in the complex: the ballroom; the tea room; the card room; and the octagon, all of them absolutely stunning, don’t you think? 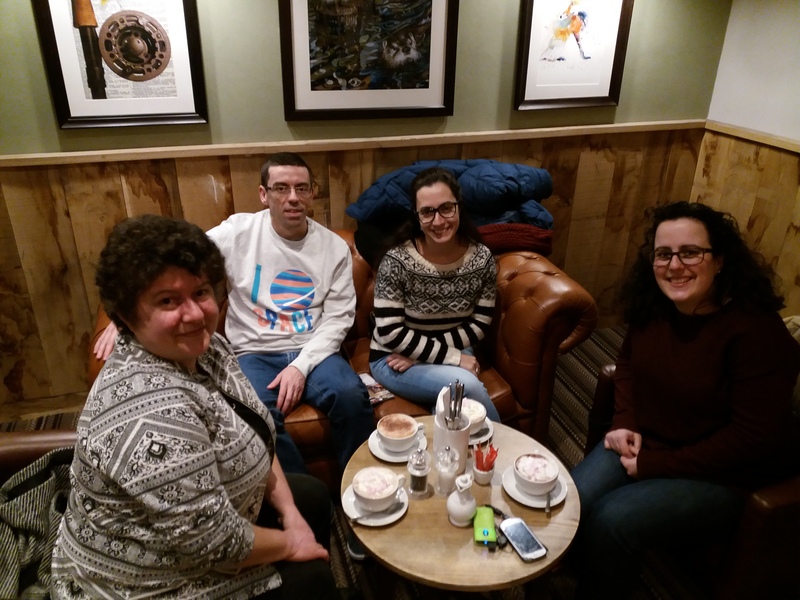 As I had been in Bath before and Joana and Mira visit it often, we accepted Joana’s suggestion to visit Lacock. I confess I didn’t know what Lacock was until she explained to me that it was Meryton!!! This was the village that BBC chose to portray the village of Meryton in the 1995 Pride & Prejudice adaptation, and where the Bennet sisters visited aunt Phillips, sought the latest gossip, the latest fashions and the latest dose of attention from the officers. The village is owned almost in its entirety by the National Trust and it felt like we were entering the 19th century due to picturesque streets and historic cottages untouched by modern alterations. How I wish we had preserved more places like this one!!! I spent a lot of time staring at the Red Lion and even made my own Mr. Darcy walk away towards it…he was just missing the Horse. We were about to leave but Mira insisted we visited a bridge she spent 3 years looking for! Yes, 3 years, that is how much she loves Pride and Prejudice. The landscape is beautiful isn’t it? But do you recognise it? Looking at the size of this post, and the amount of pictures I shared, it may look like we did a lot of things, but in the end it felt that the time was not enough to talk about all the things we wanted to talk about, and it was very hard to say goodbye to these wonderful ladies!! Now we only have the internet to keep in touch and the hope of meeting again soon! But I can not end this post without sharing all the goodies I got from this trip :))) I hardly have a chance to buy these kind of things, so I tried to bring as many items as possible. If you are seeing anything you like, you can find them all in Jane Austen’s Center shop and The Assembly Rooms shop. I hope you have enjoyed this long post and that you found these places interesting. If it has enticed you to see our favourite characters in all these places, there are plenty ways of doing so, not only you can buy the DVD’s of Pride and Prejudice and Persuasion and watch them a dozen times a year (if you don’t have them and don’t do that already! ), but you can also watch them through Amazon Prime Video. This is an option I don’t have in Portugal, but I think it is just awesome! Until my next Jane Austen Road trip, happy reading everyone! Or should I say enjoy your tv adaptations? Rita,I’m so delighted that you and the others had such a fantastic time walking in Jane’s footsteps and remembering favourite scenes from her books! It’s neat that you had the chance to be at your friends’ wedding and visit with Joana, Ana, and Mira as well as see places associated with Austen. I am so happy you had this wonderful trip and the rest of us can enjoy it vicariously! Thank you for sharing! I’m glad you had such a great time although sorry places were closed for the winter. You should have asked your friends to move their wedding to later in the year LOL. Bath is lovely though. My daughter took me and my Mum in 2011 for my 60th. I especially loved the fashion museum in the Assembly Rooms. We stayed in a lovely apartment on Henrietta Street near Laura Place and had a fabulous time. I envy you your tea with Mr Darcy though. Hopefully you will be able to visit Lyme Park another tine as it is certainly beautiful. Thanks for sharing your trip. Hugs and thanks for an amazing time! This whole accounting brings tears to my eyes — knowing my own trip to England is in the near future–still no dates set–but I am all anticipation to walk in Austen’s steps. Thank you for sharing your adventure. What a lovely post! It looks like you had a wonderful trip. And for what it’s worth, I’m with you on Persuasion. I love the Hinds/Root version. She is perfect as Anne. I like the later version too, but (I’ve said it before and I will say it again) I can’t buy Rupert as a man who had spent 8 years at sea with no suncream! What a wonderful trip you had, Rita. The wedding sounds lovely and so does the rest of your time over here. I love the photos with all of your happy smiley faces! What a shame that JAHM was closed that day. At least you’ve been there before. Can’t imagine how you’d feel if it had been your first time. If you’re planning another trip over here and including Derbyshire and/or Lyme, please let me know. They’re only a couple of hours drive away from me, so day trips are easy. Bath and Hampshire are so much further, over five hours so a lot less easy. 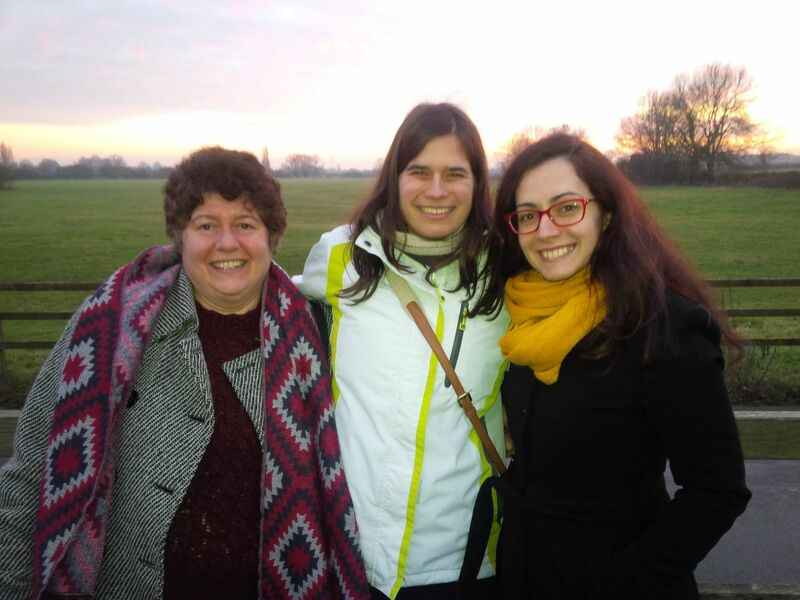 What a wonderful trip and to be able to meet up with Joana, Mira, Ana is amazing! Thank you for sharing your pictures and I think your husband is fabulous for taking you all about! So until I get this opportunity to go over and walk in Jane’s footsteps, I will look upon your pictures and and imagine I have! Thank you again!!! Your trip sounds delightful (This is the last of your blog posts that I had not read.) Love the photos. My husband and I were in Bath as part of our 2 week vacation to Great Britain in the Spring of 2004. I hated the “water” in the Assembly Rooms but enjoyed visiting the Jane Austen Centre there as well as visiting the baths. I do not like the film version which has Anne running through Bath even though her target is Rupert, lovely man that he is. At the time I visited I was not even aware of a Jane Austen Society in the USA or anywhere else so I made no effort to meet up with other fans or visit more famous sites. I did visit her grave site in Winchester. Thanks for sharing and glad to hear of your lovely time there. Yes, I recognized the bridge immediately. Sorry some sites were closed for you and Joana. I was also afraid my husband was going to wander into the wrong lane as we drove our rental car around Ireland which was part of our time in GB. I’m starting to plan my ultimate Jane Austen trip, and i don’t want to miss a thing! Is the bridge near Lacock? We cant wait to see as many film locations from the BBC production of P&P, and even stay at the Hunsford Parsonage if we can! And of course see as many Jane Austen locations as possible! This will be a once in a lifetime trip, and we are beyond excited!! Thanks for sharing your pictures with us!